In every era in the human history there has been a dominant worldview that people tried to correspond to. In an age of faith, everyone asked how they could better serve God. They started treating all the forces of nature as different Gods and worshipping them. This was their daily concern. In the Industrial revolution the world evolved towards economics and improving one's slice in life. In an age dominated by scientific research and development, the question shifted again--people asked everyday how they could keep up with progress and add to it. As times change, so do people's vision of what is important, and usually they thought they had a better vision than the one which preceded them. Yet if you back away to see the bigger picture, each era had one thing in common, which wasn’t a particular object. Ideas came and went or they evolved and transformed, but a constant truth is that human beings desire progress innately. They seek fulfilment through constantly striving for more whether they realize it consciously or not. It was the fundamental idea that life is well lived only if you have a vision. Without one, purpose and meaning are limited. It turns out that the one question you should ask every day is this: How can I fulfill my vision today? Whether they put it exactly in these words, this is the secret behind the greatest success stories. Someone dedicated his or her life to a plan, project, or set of values larger than any individual. A worthy vision, I think, needs to fulfill certain criteria. 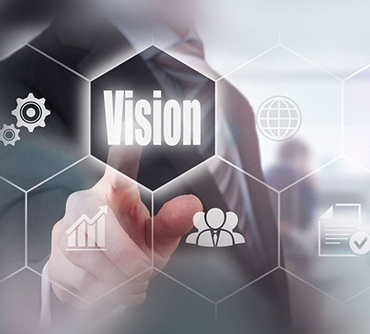 A vision is not only essential in terms of a business or professional environment but you need to have it in most areas of life, if not all. It is a picture of where you want to be at this point in time at every important aspect in life like health, relationships, career and even as a personality what you want to be like. A life without visions will be only be catering to the never ending demands of the world around us. Remember, either you have your own vision and live it, or you will have to be part of someone else’s visions and plans within no time. 1. Your vision should be aligned to your value system. It can't be borrowed from someone else, and it can't be chosen out of obligation. Your parents may desperately have wanted you to follow the family business or go to medical school because they weren't able to. Though they did have positive intentions, but it's risky to adopt a vision that isn't really your own. Their visions may be based on their sphere of reality and their previous experiences or what was most important at the time that they grew up. Then there are societal rules to tell you what you should and should not do, think, act, behave and the list is endless. 2. Your vision should be valuable no matter how much money you expect to make. Of course, you can always make it your vision to get rich, but there are two problems with that. First, the day you arrive at a financial goal, it will tend to feel empty. Second, a life totally devoted to money never stops making more and more--greed and competition fuel an insatiable desire. Before you can begin to design your ideal career, you need to design your ideal life. Most people set goals that are much too small because they don’t believe something bigger and better is possible. Now is the time to go beyond your current limitations and beliefs and find out what you really want to do in life. The biggest mistake people make is trying to design their lives around their careers. It works much better the other way around. Start by designing your ideal life and then figure out what sort of career would support it. 3. Getting to a vision is an iterative process, you should compare the options that seem most appealing, which means doing research and trying a variety of options, gaining knowledge and being flexible. Philosophy, religion, science, art, music, business, and scholarship are rich with potential, and you owe it to yourself at least to sample what they are like. 4. Your vision should be ambitious. the old saying that a man's reach (or a woman's reach) should exceed his grasp still holds true. Settling isn't visionary. Pick something that will feel like a challenge every day for as long as you can see into the future. Because one of the fundamental human needs is a need for variety. We get bored with the routine if there is no challenge in it frequently. In order to keep our momentums high, there has to be a fuel for the brain as frequently as possible. 5. Finally, don't lose sight of two words that often escape notice when someone has burning ambition and drive: happiness and love. The more you can increase these two qualities, in your life and the lives of others, the more worthwhile your life will seem as it unfolds. A hugely successful life devoid of happiness and love is of no meaning and will always leave you hungry for more. Having a vision or goals helps to direct the focus and energies in a given direction. Currently you may be lacking the skills or expertise to be in the vision, but having a picture in your mind automatically drives the small action points that you need to take in order to upgrade yourself to that level. But what is the important factor which is the driver for creating visions? It is the belief systems that you are carrying Everyday life is impossible without holding your own set of beliefs. Just because belief exists silently doesn't make it less powerful. Most people are guided by belief in the work they do, their religion, loyalty to their family, and all kinds of values they hold dear.